I have become increasingly excited for each class and a presentation on more performance artists. Starting with the first which gave a wonderful introduction to performance art and where the artists were coming from that would have spurred them on to do the work that they did. I think this is a very important thing to understand when it comes to understanding this kind of artwork. You have to see the influence of Dada, Futurism and Surrealism to come to terms that performance art was a continuation of pushing boundaries and developing the definition of art. The first artist we looked at was Yves Klein. Klein is interesting to me not only for his use (almost to the point of overuse) with the color blue (which happens to be my favorite color), but also for his concept of "the void". Defining space by the lack of in a space. Creating by removal. Using emptiness as form and structure. 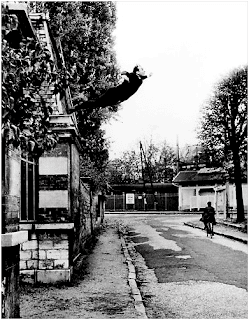 My favorite work by Yves Klien was his "Leap into the Void" photograph. It was wonderful for both its visual interest and suspense and also for it pre-photoshop development. The next artist we discussed was Tony Orrico, who is by far my favorite artist thusfar. His work creating spherical shapes on huge sheets of paper with graphite are fantastic. As someone who loves to dance I really appreciated the way he totally encompasses his body into the creation of the work. He keeps his arms movements in sync and his rolling and shifting movements are carefully measured. 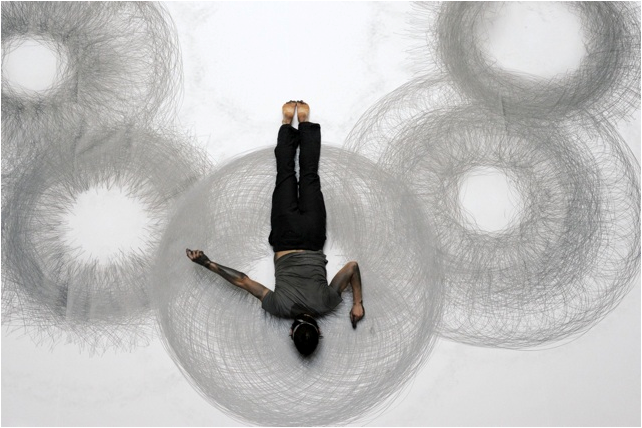 I also love the meditative quality, endurance, and mandala-like quality of his work. Watching the video of him working was totally mesmerizing. For me, I think that doing something of this nature would truly be a kind of spiritual experience. I would love to do something similar to Orrico's work at some point (as soon as I have obtained an extremely large sheet of paper). 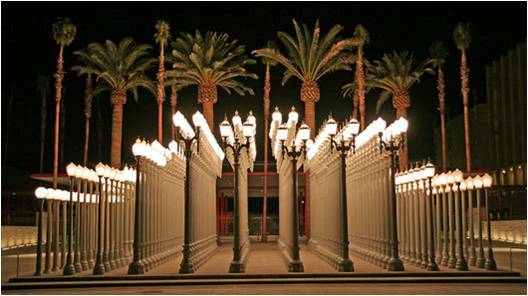 Chris Burden is one of the most interestingly bizarre people we have studied so far. He has lived in a locker for five days, gotten shot in the arm, laid in the street rolled in a tarp, stuck live wires to his chest, and crucified himself to a car. I think that he has a lot of intriguing thoughts about different things, however I think what makes Burden so hard to really appreciate is that he doesn't really seem to make plans and follow through to express an exact thing to a specific audience. His works are often spontaneous and seem to lack real need to show meaning or structure. I think what can be taken from performance artists like Chris Burden is that they live fully immersed in their art which is directly integrated into their life. I would say that my favorite would have to be Urban Lights for its aesthetic quality. Lastly, the New Genres class was introduced to Marina Abramovic. I thoroughly enjoyed all of the works that we saw by her in class (The Artist is Present, Rhythm 10, Relation in Time, AAA_AAA, and Imponderabilia). Abramovic's work has a lot to do with ritual, endurance, the body, human nature, relationships between people and interactions. I think she totally integrates herself into her art, bringing her experiences and trials through endurance rituals to each work that she does (and I think that is why I love her performance art). I liked her quote on the difference between theater and performance art and I think it is very telling about how she approaches her performances. I also enjoyed seeing the Marina "Boot Camp" video where she instructs others in focusing their mind and bodies in the way that she does for her performance works. If I had the chance to do something like that, I would definitely do it.